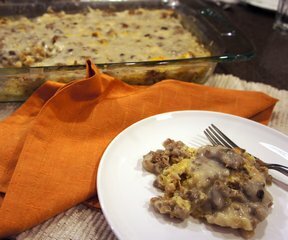 A breakfast bake that will remind you of sausage gravy over biscuits without all the work. 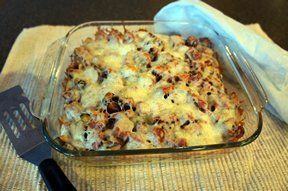 Make it the day before and put it in the oven for an easy breakfast for company. Brown sausage, breaking it up with a fork as it cooks; drain and set aside. Place croutons in a greased 9x13 inch baking dish. Sprinkle 1 1/2 cups cheese on top. Spread sausage on top of cheese. Beat eggs with 2 1/4 cup milk and dry mustard. Pour over croutons and refrigerate overnight. Remove refrigerated dish and sprinkle remaining shredded cheese on top. In a separate bowl, dilute soup with remaining 1/2 cup milk and pour over top. Bake at 325 for 1 1/2 hours. 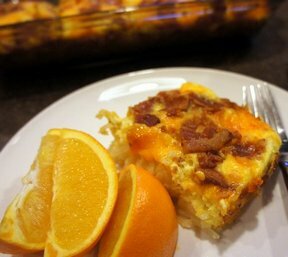 "If you haven't had this egg bake before, you need to. 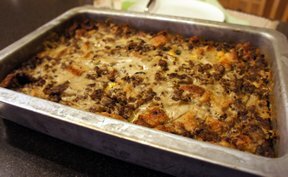 The sausage and cream of mushroom is perfect with the croutons and egg. Great when you are having company stay over."